Bell/AT&T Labs was trying to invent a new type of switching system that didn't have mechanical parts. Their first field trial attempt was the Morris, Illinois experiment from 1958 to 1962. This used a "cold cathode" vacuum tube technology. This experiment lasted a little bit more than a year and was later scrapped for the fully transistorized 1ESS system in 1965. The Morris, IL experiment was conducted between 1958 and 1962. This involved using a stored program control switch that used "cold cathode" gas tubes. The phones used on the system were rotary, but were 20 pulses per second rather than the regular 10. The switch was not in use 24 hours per day and customers had two telephones. One was used with the existing #5 crossbar switch, one was for the experimental switch. The experimental switch didn't have a traditional tone plant, and used an electronic tone plant. These tones were not used in the later ESS system. The experiment ended in 1962 and the project was scrapped in favor of fully transistorized systems, such as the 1ESS (Number 1 Electronic Switching System) which was introduced in 1965. 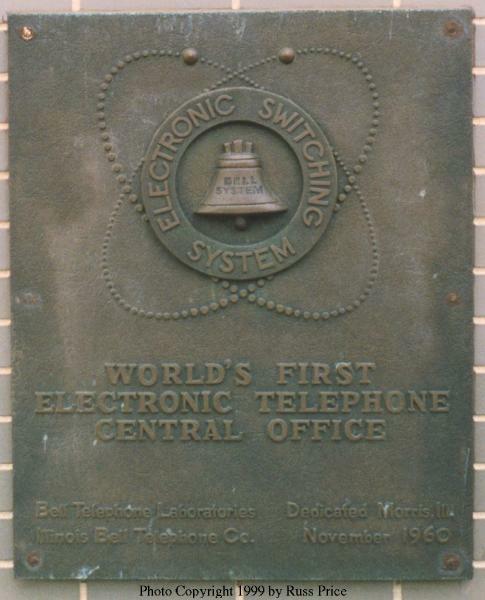 The following is a plaque that was installed at the central office where the experimental switch was located. cold-cathode gas tubes. So, unlike 1ESS, Morris had no moving parts. because the gas-discharge tubes couldn't handle the usual 86V ringing signal. voltages, were not supported at all. test system had over 2000 vacuum tubes, plus 30,000 gas-discharge tubes. would have had rather large numbers of vacuum tubes. Pictures of the Morris switch show a truly strange-looking system. provide enough free electrons so that the tubes would ionize quickly. tubes running vertically down the racks.